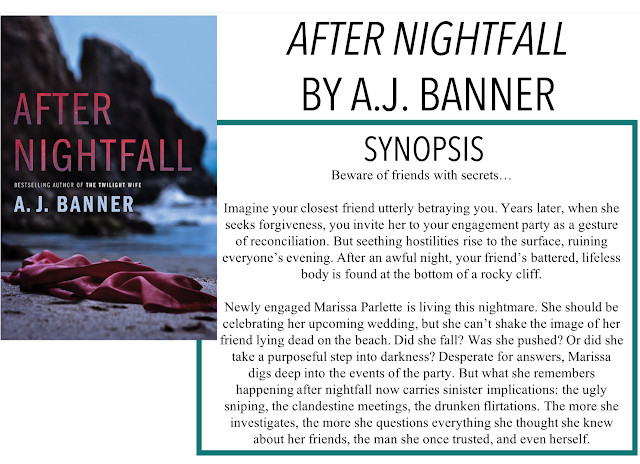 I read The Twilight Wife when it first came out and loved it so I knew I had to jump on the latest from Banner right away! I am back with another review, After Nightfall by A.J. Banner. Thanks so much to Thomas Allen and Sons for sending me a copy of this book for an honest review, as always, all opinions are my own. This book follows Marissa, a woman who has just gotten engaged to the perfect man. She invites her estranged childhood best friend, Lauren, her husband, Jensen, and her fiancé's brother, Keith, and sister-in-law, Hedra, over for a dinner party to celebrate. The next morning, Marissa finds Lauren at the bottom of the cliff behind their home - murdered. Or at least that's what Marissa thinks. Because Lauren wouldn't have jumped. And because she knows Lauren was about to tell her something-something about her fiancé. Everyone is acting cagey, most of all Marissa's fiancé, Nathan. So I'm not sure how I really feel about this book. It was definitely suspenseful and I had no idea what really happened until the very end when Banner got to that point in the plot, but I'm feeling like maybe I'm burnt out on thrillers? Don't get me wrong, I think I was more into them and this story, I would have read it quicker and enjoyed it more - that's not the fault of the book. The characters were interesting but there were so many, sometimes I had a hard time keeping track of who was who. I felt like the college betrayal of Lauren was interesting but had very little to do with the story itself and just kind of felt like a filler. I'm actually starting to think that maybe I didn't love this book as much as I thought I did. I think that the plot line is both unique and a little cliché. When you find out the ending, you get this kind of "Oh, of course, they did it" feeling because it makes sense, but then as you're reading it, you have no idea who to suspect. I don't know, this is kind of an all over the place review and I'm not really sure how I feel about this book. I would say if you are a fan of Banner, check this one out.